Despite my recent fangirling about the manga adaptation being better than pretty much any other Les Mis adaptation out there, let's make one thing clear: I still love Les Misérables the musical. And, luckily for me, there are going to be three interesting new productions of the musical in Northern Europe later this year. To no one's suprise, I've already bought tickets to all of them, so let's take a little look at each. I've known about this since last Christmas, and I'm still getting butterflies in my stomach every time I think about this. I have been waiting for this production for over five years. I've said it before and I'll say it again: Åbo Svenska Teater's 2010–2012 production of Les Misérables means more to me than any other musical. I loved it more than anything and saw it over a dozen times, and right after the production closed, I started wishing that Alexander Lycke would one day reprise his role as Jean Valjean. I've indeed been excited since last Christmas – or, more accurately, since Åbo Svenska Teater's last Christmas concert. It was a lovely December evening filled with holiday songs and musical tunes, with Alex as one of the solists. I and a couple of other musical fans stayed behind after the concert to say hi to him. When I thanked him for his beautiful rendition of Bring Him Home, he just went, all nonchalantly, you should come to Jönköping next year then! Such fantastic news shouldn't be shared without some sort of a forewarning. I almost keeled over from pure happiness. I have felt such a quick and genuine rush of joy maybe three, four times in my life in total. There are many fantastic portrayals of Jean Valjean out there, but as far as I know, no one sings the part better than Alex. And now, as if getting to hear him in the role again wouldn't be good enough, this production is also going to be a replica of the Wermland Opera production I adored that made Valjean more three-dimensional and human than any other version of this musical I've ever seen. Listen to Alex's version of Bring Him Home from the ÅST production. 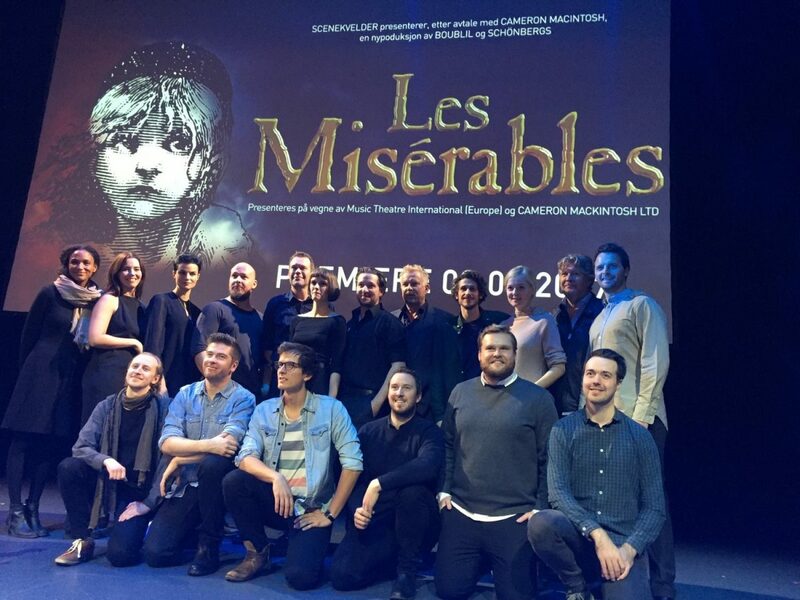 The cast of Folketeateret's Les Mis. Photo from their website. This is exciting for a different reason: I've never been to Oslo before, so I'm super glad I finally have a good excuse to visit (or two, since I'll also be seeing the upcoming Norwegian production of The Book of Mormon that weekend). I know next to nothing about this production and its cast, but I think that's just as good. It's a nice feeling to be seeing your favourite musical yet not quite knowing what you're going to get. Let's hope Norway will be good to us. This one is so interesting that I'm taking some friends with me... Seven of them, to be exact, and we're all going to see the premiere! The reason the new Estonian production of Les Misérables is of interest to us Finnish fans is that it'll be directed by Finnish Samuel Harjanne. In Finland, Harjanne has performed in three different productions of Les Mis (first as Gavroche, then as assorted barricade boys including Enjolras). Having seen him onstage in various Les Mises almost 20 times, I'm sure it'll be really interesting to see how he'll direct the show. The cast seems strong, too. There are alternates, so I don't yet know who we are going to see – but in any case, I'm glad to know my favourites from the recent Estonian production of The Phantom of the Opera, Koit Toome (a sweet Raoul and a fantastic Phantom) and Maria Listra (the most independent, strong Christine I've ever seen), will play the roles of Jean Valjean and Cosette. It's also nice to see Ele Millistfer returning to the role of Fantine after having seen her touching portrayal in the 2013 Finnish production. Most of all, though, I'm just excited I'll get to travel to Tartu with so many friends to see the premiere of this production. No matter what, it's going to be a Les Mis road trip – and, really, a Les Mis autumn – to remember. It's been two years since I've last seen Les Mis, but there's going to be a new tour across the country starting this fall. It's coming to Little Rock in December, which is close enough to drive, so I'm making tentative plans. I know nothing more about it (except that it'll likely be the same staging and props and costumes as the most recent tour/Broadway production), but I know what you mean when you say "it's a nice feeling to be seeing your favourite musical yet not quite knowing what you're going to get."